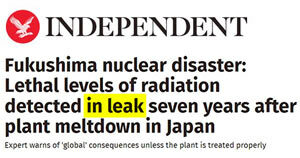 And Here, You Thought Fukushima Had Ended, Silly You! Fukushima is not over, not by a long shot. Every day since March 11, 2011, Japan has allowed the radioactive water to run into the ocean. Japan has threatened their doctors about telling the truth about the illnesses that have plagued the Japanese people since the meltdown, and have arrested and threatened numerous reporters for reporting the truth. Fukushima has global consequences because all of our oceans connect to one another. Japan is supposed to be readying to release 100 million tons of radioactive water into the Pacific Ocean. Chernobyl’s reactor No. 4 in Ukraine suffered several explosions, blew apart and burned for 40 days, sending clouds of radioactive materials high into the atmosphere, and spreading fallout across the whole of the Northern Hemisphere — depositing cesium-137 in Minnesota’s milk. The likelihood of similar or worse reactor disasters was estimated by James Asselstine of the Nuclear Regulatory Commission (NRC), who testified to Congress in 1986: “We can expect to see a core meltdown accident within the next 20 years, and it … could result in off-site releases of radiation … as large as or larger than the releases … at Chernobyl. Fukushima-Daiichi came 25 years later. Contamination of soil, vegetation and water is so widespread in Japan that evacuating all the at-risk populations could collapse the economy, much as Chernobyl did to the former Soviet Union. For this reason, the Japanese government standard for decontaminating soil there is far less stringent than the standard used in Ukraine after Chernobyl. 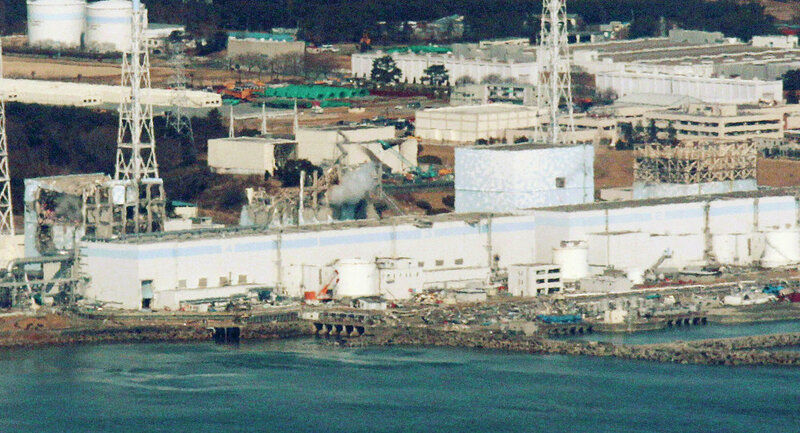 The Korea Atomic Energy Research (KAER) Institute outside of Seoul reported in July 2014 that Fukushima-Daiichi’s three reactor meltdowns may have emitted two to four times as much cesium-137 as the reactor catastrophe at Chernobyl. Ocean release of cesium-137 from Fukushima (the worst ever recorded): 121.6 to 131.2 quadrillion Becquerel (16% x 760 to 820 quadrillion Bq). Atmospheric release of Cesium-137 from Fukushima: 30.4 to 32.8 quadrillion Becquerel (4% x 760 to 820 quadrillion Bq). Total release of Cesium-137 to the environment from Fukushima: 152 to 164 quadrillion Becquerel. Total release of Cesium-137 into the environment from Chernobyl: between 70 and 110 quadrillion Bq. The Fukushima-Daiichi reactors’ estimated inventory of 760 to 820 quadrillion Bq (petabecquerels) of Cesium-137 used by the KAER Institute is significantly lower than the US Department of Energy’s estimate of 1,300 quadrillion Bq. It is possible the Korean institute’s estimates of radioactive releases are low. In Chernobyl, 30 years after its explosions and fire, what the Wall St. Journal last year called “the $2.45 billion shelter implementation plan” was finally completed in November 2016. A huge metal cover was moved into place over the wreckage of the reactor and its crumbling, hastily erected cement tomb. The giant new cover is 350 feet high, and engineers say it should last 100 years — far short of the 250,000-year radiation hazard underneath. The first cover was going to work for a century too, but by 1996 was riddled with cracks and in danger of collapsing. Designers went to work then engineering a cover-for-the-cover, and after 20 years of work, the smoking radioactive waste monstrosity of Chernobyl has a new “tin chapeau.” But with extreme weather, tornadoes, earth tremors, corrosion and radiation-induced embrittlement it could need replacing about 2,500 times. John Laforge’s field guide to the new generation of nuclear weapons is featured in the March/April 2018 issue of CounterPunch magazine. Duluth News-Tribune & Herald, “Slight rise in radioactivity found again in state milk,” May 22, 1986; St. Paul Pioneer Press & Dispatch, “Radiation kills Chernobyl firemen,” May 17, 1986; Minneapolis StarTribune, “Low radiation dose found in area milk,” May 17, 1986. Ian Fairlie, “TORCH-2016: An independent scientific evaluation of the health-related effects of the Chernobyl nuclear disaster,” March 2016 (https://www.global2000.at/sites/global/files/GLOBAL_TORCH%202016_rz_WEB_KORR.pdf). James K. Asselstine, Commissioner, US Nuclear Regulatory Commission, Testimony in Nuclear Reactor Safety: Hearings before the Subcommittee on Energy Conservation and Power of the Committee on Energy and Commerce, House of Representatives, May 22 and July 16, 1986, Serial No. 99-177, Washington, DC: Government Printing Office, 1987. Progress in Nuclear Energy, Vol. 74, July 2014, pp. 61-70; ENENews.org, Oct. 20, 2014. One of the key power generation system components of Unit 1 of Taishan nuclear power plant cracked during an earlier pre-production test, according to a report by FactWire News Agency. “A ‘boiler’ in Unit 1 appeared to have cracked during functional testing and must be replaced, according to a nuclear plant employee,” the FactWire News Agency report reads. “He also told FactWire undercover reporters when they visited the site last month that representatives from Harbin Electric, the Chinese manufacturer of the ‘boiler’, came to the plant for a week in late October to discuss with the plant operator, Taishan Nuclear Power Joint Venture, a plan to replace the faulty ‘boiler’,” according to FactWire. Taishan Nuclear Power plant is being made by the joint venture between the China General Nuclear Power Corporation (CGN), which is a China state-owned company, and the French electricity company Électricité de France. “China General Nuclear Power Corporation (CGN), the developer of the Taishan nuclear project, said on Tuesday afternoon that there were ‘partial defects’ in the welding of the deaerator in question, but insisted ‘replacement work was near completion’,” FactWire News Agency writes. CGN’s official document says that the deaerator of Taishan Unit 1 is 46.6 meters long and 4.76 meters in diameter. “Last week, a Dongfang Electric engineer also confirmed to FactWire that the deaerator was supplied by Harbin Electric and the welding on the deaerator was ‘problematic’,” the FactWire News Agency report reads. Dongfang Electric is also co-responsible for manufacturing components for the Taishan nuclear power Unit 1. The power plant is located 67 kilometers from Macau and 130 kilometers from Hong Kong, and is still under construction. Safety concerns were raised last year after components of the nuclear plant were discovered to have been made in mainland China, not in France as previously thought. According to FactWire, China had been hoping to launch Unit 1 this year, whereas French engineers who were sent to Taishan for the project, told FactWire that it could only be launched in 2018 at the earliest. “The National Nuclear Safety Administration of China stipulates that a nuclear plant must seek permission from the agency before loading fuel assemblies to conduct tests. But public records show that Taishan Unit 1 has yet to have received such a permit,” FactWire reported. Last year, members of the civil society had asked the MSAR government to clarify both issues related to the emergency plan and possible risks posed by the nuclear plant to Macau’s population. 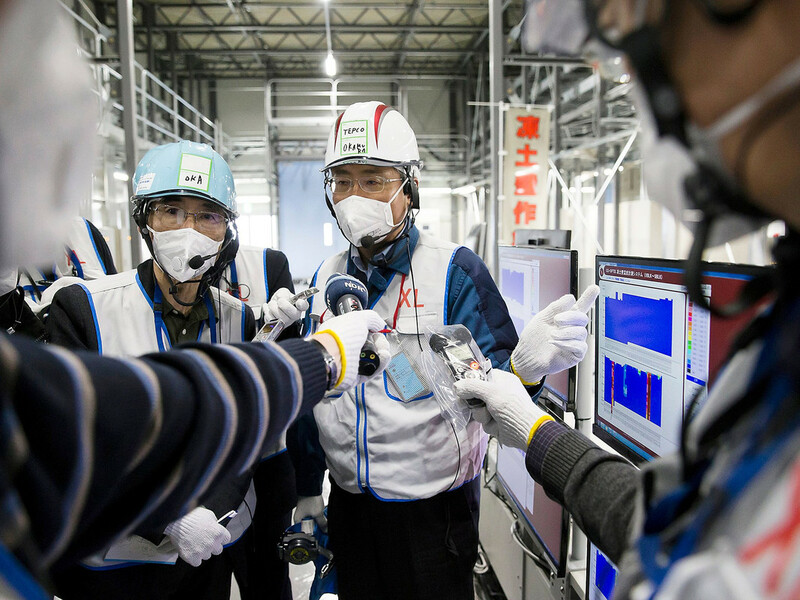 A local delegation visited the nuclear plant to check the safety of the infrastructure. The head of the Security Forces Coordination Office, Choi Lai Hang, led the local delegation and explained that Macau would not require protective measures, even in the event of a very serious nuclear incident (level 7) at the Taishan nuclear power plant. Asahi Shimbun, Jul 23, 2017: Melted nuke fuel images show struggle facing Fukushima plant — Images captured on July 22 of solidified nuclear fuel debris at the bottom of a containment vessel of the crippled Fukushima No. 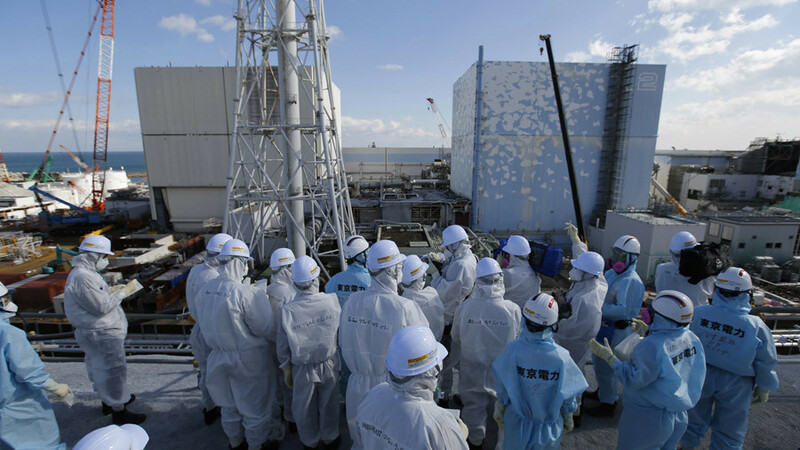 1 nuclear power plant show the enormity of decommissioning of the facility… [TEPCO] also discovered that the nuclear fuel debris has spread throughout the containment vessel. Kyodo, Jul 23, 2017: The robot was sent closer to the bottom of the reactor on Saturday and found possible fuel debris scattered in a wide area. Japan Times, Jul 21, 2017: Fukushima robot finds potential fuel debris hanging like icicles in reactor 3… The objects spotted this time look like icicles… Tepco is pinning its efforts on technology not yet invented to get the melted fuel out of the reactors. Reuters, Jul 21, 2017: Tepco detected black-colored material that dangled like icicles that could be nuclear debris near the bottom of the reactor’s pressure vessel that contained the fuel rods, the report said, citing unnamed sources. Financial Times, Jul 24, 2017: [Kimoto] was reluctant to speculate on the nature of seemingly corroded orange patches in the images. NHK, Jul 23, 2017: [TEPCO] says Saturday’s probe found lumps that are highly likely to be fuel debris piling up at the bottom of the containment vessel… The deposits are estimated to be one to two meters thick. Images released on Saturday show black, rock-like lumps and what appear to be pebbles and sand accumulating at the bottom. ENENews Headlines for the last week. It is not good. Tepco is dangerous to the rest of the world!